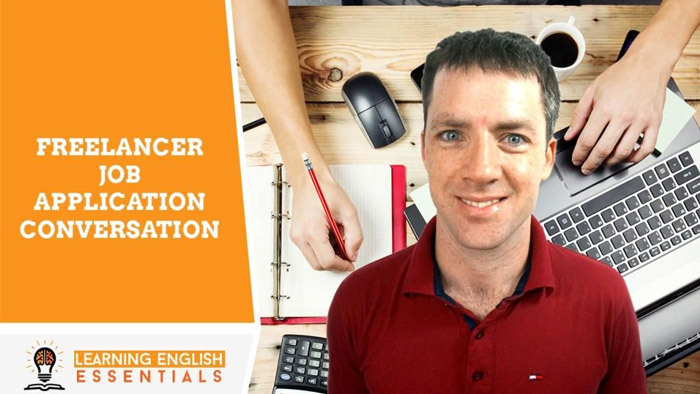 In this video of the English Conversation Topics series, I take you through an English conversation that demonstrates applying for a freelance job contract. A: Hello Madam, I have read your recent job posting for a Web administrator to set up some product pages in WordPress. I feel that I would be a good match for the task. B: Hello John, thanks for contacting me. Tell me more about your experience and why you think you can complete this job. A: I have been a website administrator for 3 years full time working with frameworks including WordPress, Ruby On Rails, and Drupal. I studied Computer Science at university and have completed many jobs like the one you require. I am confident that I can complete the task quickly and properly. B: Can you show me examples of some product pages you have set up in WordPress for your clients? A: Yes, I can Madam. Some clients had me sign a confidentiality agreement, however, I have provided some examples of pages I have set up with permission from my clients. B: This is great. Do you have any testimonials for your past client jobs? A: Yes, Madam, I can provide you a link to my online profile. It has all of my recently completed jobs and the feedback and ratings from my clients . B: How long do you estimate it will take you to complete this task? A: I estimate that this will take me 3 hours to complete. I can finish it by tomorrow morning, 11am. B: What is your rate? A: My rate is $20 an hour. B: Let’s set the fixed price for the job at $60. Do you agree? A: Yes, Madam. Can you please send through the job contract so that I can begin? A: What is the best way to contact you if I have any questions regarding the job? A: Copy that Madam. Can you provide me with website access and all of the content to be created? B: Yes, I will. I will add it so you can access everything via our Google Drive. Do you need anything else to get started? A: No Madam. This should be enough for me to get started. I will contact you if I require anything else. B: I look forward to the completed job. A: Thank you for the opportunity to work with you. I appreciate it very much. B: You’re welcome. Talk to you soon.